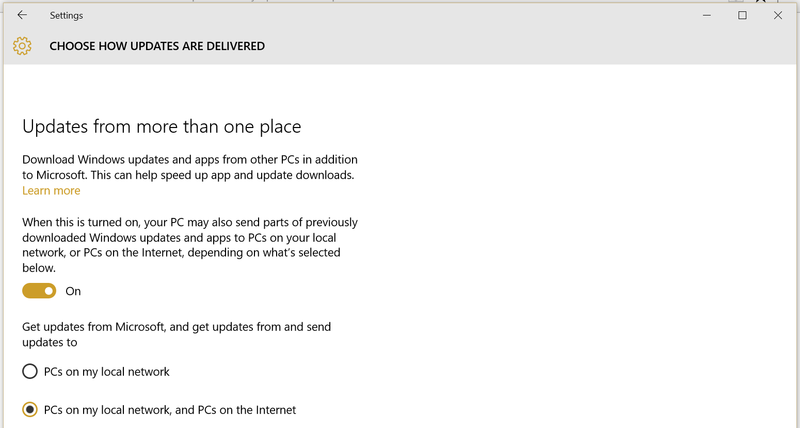 Windows 10 has a feature called "Windows Update Delivery Optimization" which is designed to help users get updates faster by connecting to other Windows 10 users on lock network or Internet. It’s basically how BitTorrent works, peer-to-peer. Windows 10 Home and Pro have this feature enabled by default for both local and internet. Windows 10 Enterprise and Education also have the feature enabled, but only for the local network. Go to 'Settings' and then 'Updates and Security' tab. Under 'Advanced Options' you can disable "Updates from more than one place" completely. I've set it to "PCs on my local network", since I've three Windows 10 PCs in my house. This is the first thing I did after upgrading.